Matching Outfits to seal a Lifetime of Friendship! Have you made new FRIENDS yet? What about a matching outfit to seal the friendship? 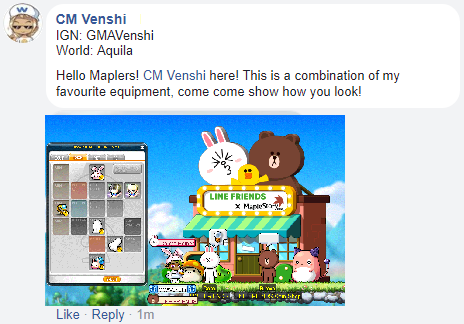 Simply post a picture of your character(s) dressed as a friend to our beloved LINE FRIENDS with Facebook post here, showing us the different cash equipment pieces used to seal your permanent friendship bonds! Participants must use at least 1 LINE FRIENDS related cash item obtained from the LINE FRIENDS Random Boxes. Users are free to submit as many entries as they wish to. However, each user will only be able to obtain rewards from this event once. Please also remember to post your Character IGN and World when submitting! Mix and match your favourite pieces, or even sew your own new cash outfits with our new Masterpiece Machine updated this Spring with a fresh Starry outlook! Just remember that at least 1 LINE FRIENDS Cash Equipment must be used! Don't pass up this opportunity to bring a memento of your forged friendships to greater heights! 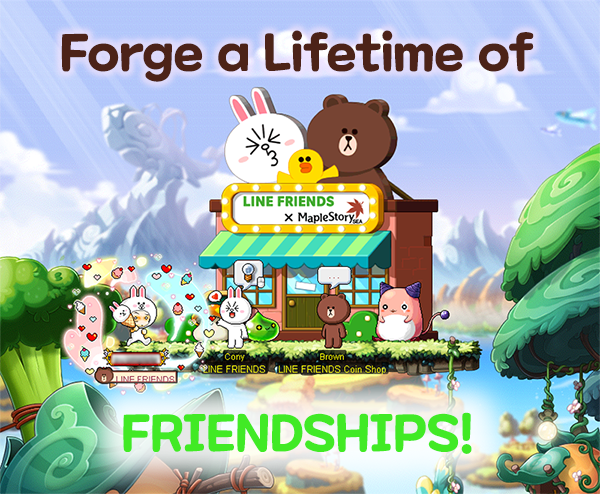 All eligible participants will receive a random 90-days LINE FRIENDS themed mounts! That's right, everyone who participated! Up to 3 best dressed or impactful participants will win a special LINE FRIENDS x Maple Mash-up Chair (untradeable) available only in our LINE FRIENDS Collectibles, Collector event! . This event will run from now until 27th March 2019, 2359hrs. Submissions will then be closed and results will be tabulated within the next week. Friendships forged will serve as a foundation for a lasting relationship. 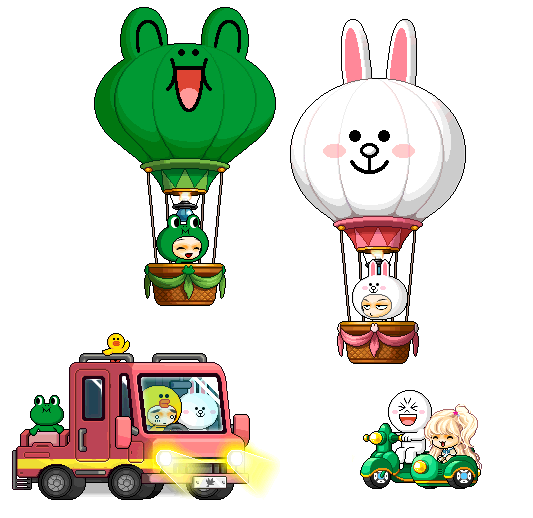 Only entries that depict the character using at least ONE (1) LINE FRIENDS (Cony, Sally, Leonard) Equipment item obtained from the LINE FRIENDS Random Box will be eligible for the participation reward and to win the final chair reward. If a winning entry is accused of plagiarism, the participant shall forfeit his or her entry and at the same time bear legal responsibility for the plagiarism. This rule shall also apply to all other submitted entries who are found guilty of plagiarism. All submissions must be submitted in the fixed format in the appropriate Facebook post. Comments or discussion not pertaining to the contest posted up may be deleted at the administrator's discretion without warning. Item codes will be sent to the player's registered email address on their MapleSEA Passport ID that matches the IGN submitted. Players must ensure that their email addresses stated on their MapleSEA Passport account is active and accurate. Playpark Pte Ltd and Nexon Korea Corporation will not be held responsible in cases of lost email, or cases whereby the participants cannot be contacted via their registered email addressed tied to their MapleSEA Passport account. All decisions by Playpark Pte Ltd and Nexon Corporation are final & binding. Playpark Pte Ltd and Nexon Corporation reserve the right to edit or change any of the above without prior notice.